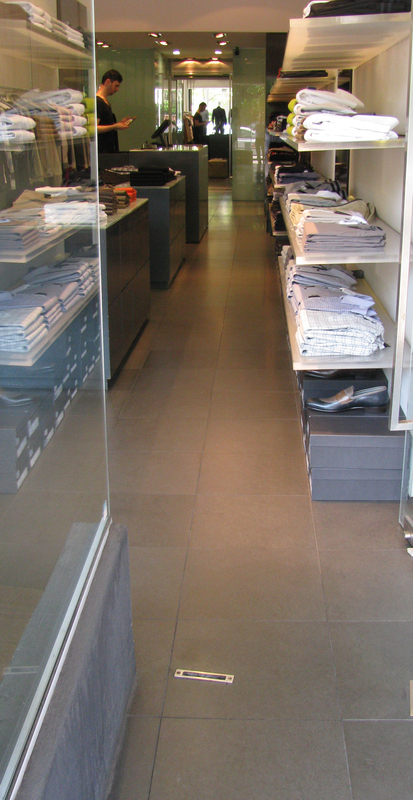 Bellambi bluestone with a honed finish is available in two shades light and dark grey. The dark honed product is derived from darker coloured rock which is slightly less dense than the light material. It also has a small percentage of of unique "cat's paws". The light honed Bluestone has a soft mid-grey surface with micro holes that are almost invisible to the eye and no cat's paws. It is extremely dense with low water absorption rates and does not scratch easily. On the tests we have conducted there is no evidence of moisture sensitivity. All the available evidence indicates this stone has impressive durability. This image is one taken from a beautifully designed home with bluestone throughout - dining room, kitchen, living room and hallway. The result is stunning bright colours e.g. 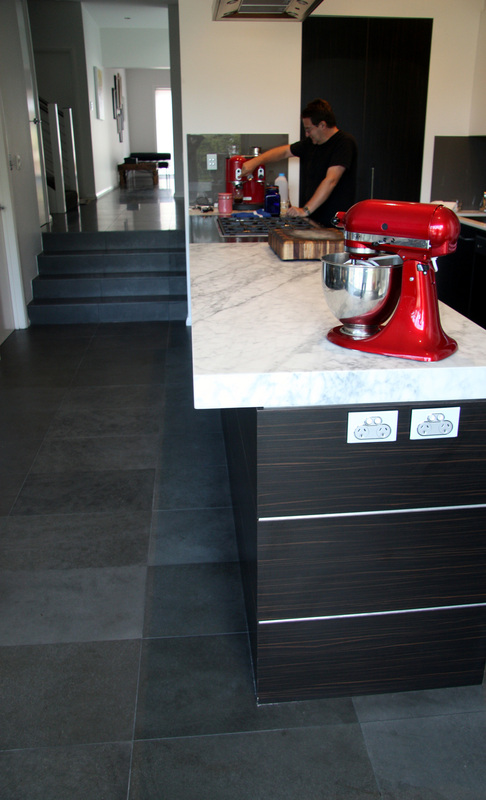 red being used to contrast the formality of the dark grey bluestone. 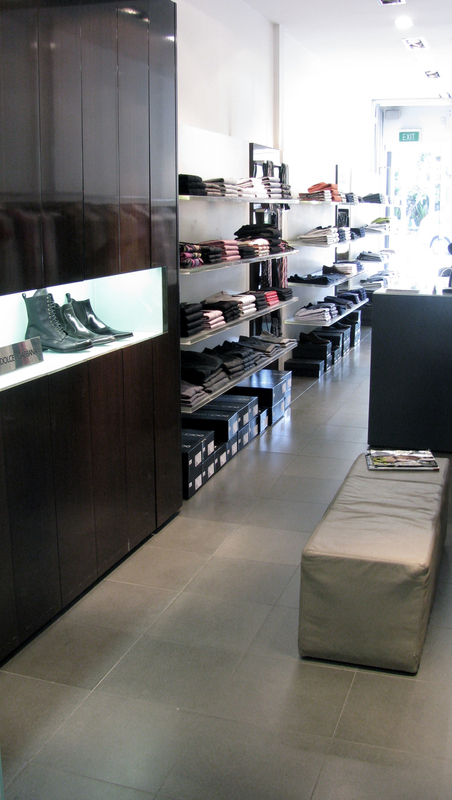 This image is a menswear store in Oxford Street, Paddington. The strong light reflections off the walls have distorted to surface colour making it look more brown than grey. The floor was laid in 2005 and is still wearing very well despite the heavy traffic. 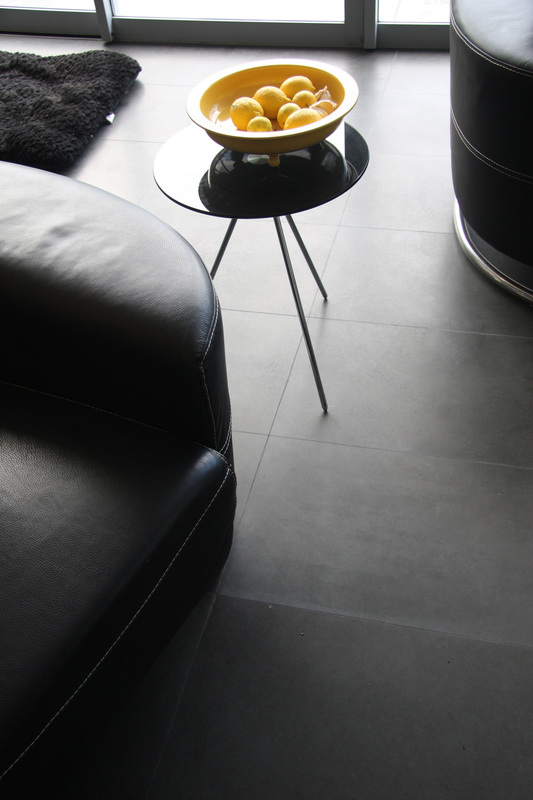 The honed surface is ideal for indoor use on both floors and walls. This product is also ideal for wall cladding using an adhesive recommended (eg ardex) for wall fixing. the adhesive should be "buttered" evenly over the back of the tile to avoid possible discolouration on the front of the tile. fixing by the spot bonding method should not be considered.